Pantry Boy provides all the ingredients already washed, chopped, sliced, and prepared to provide well-balanced, delicious, nutritious home-cooked style meals. 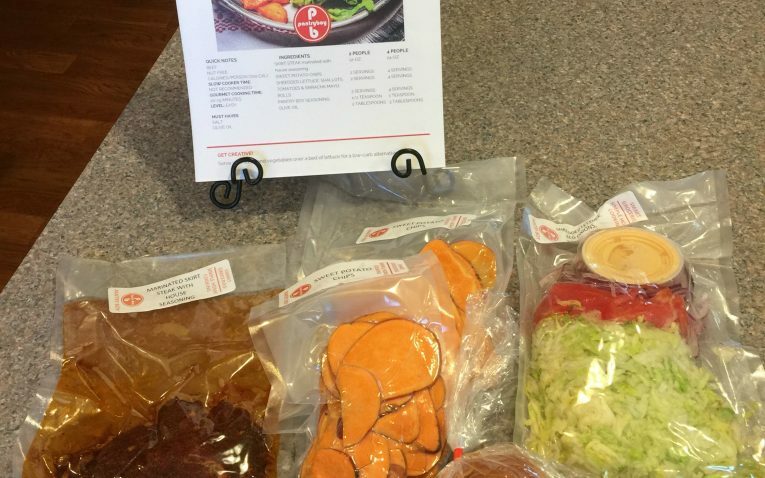 Everything is ready to go – even the meats come already marinated and vacuum sealed – this means meals with Pantry Boy are quick to make and get on the table. 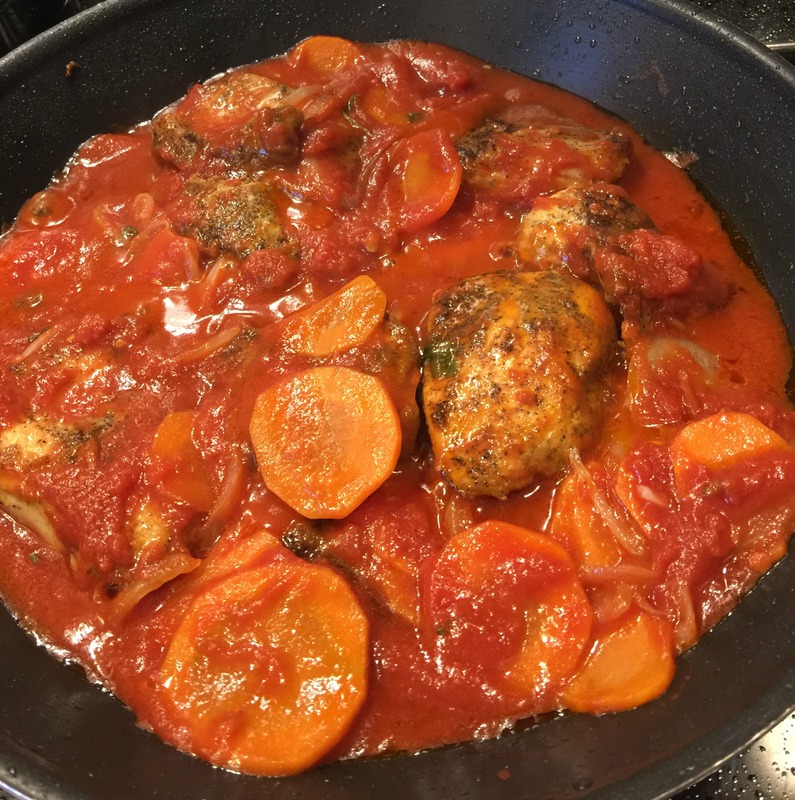 They provide two cooking options – 1) a fast cook option which usually involves the stove top and/or oven, or 2) a slow cooker method for those days when you just want to throw something in the crockpot and come home to a ready to eat meal. Not all meals you get will be recommended for the slow cook method, however. You can see which option is suggested when ordering. 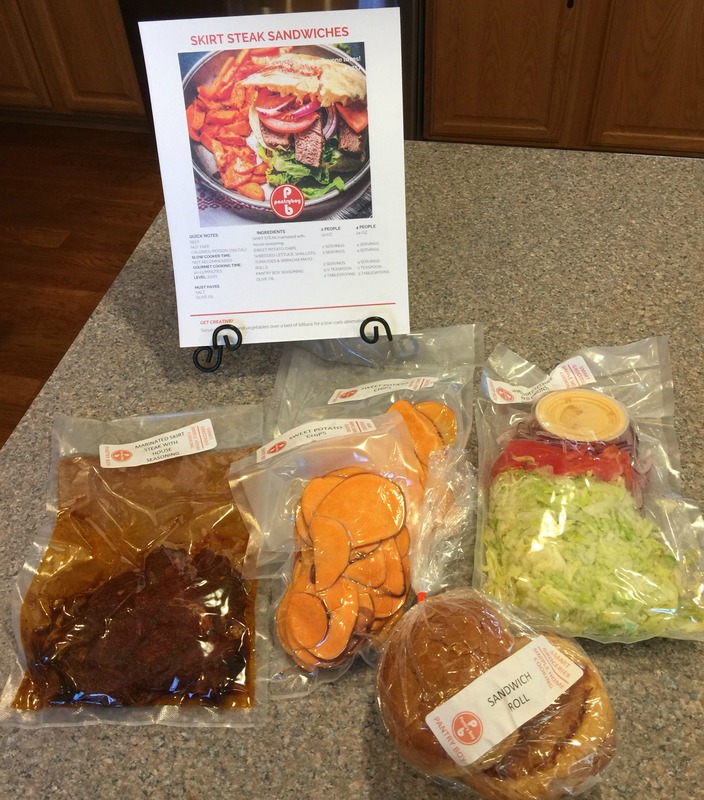 A meal kit service that focuses on providing pre-portioned, already prepared(think wash, chop, marinade) ingredients for quick, nutritious and delicious meals. Pantry Boy provides three carnivore, three omnivore, and three vegetarian meals each week. The omnivore meals pull from both the vegetarian and carnivore menu, so in reality there are only six menu options each week. You do not get to select your meals. 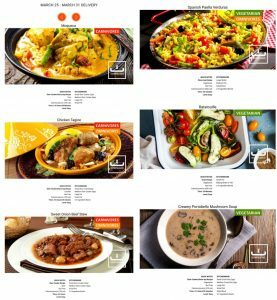 The meals are chosen for you based on your box selection (carnivore, omnivore or vegetarian). 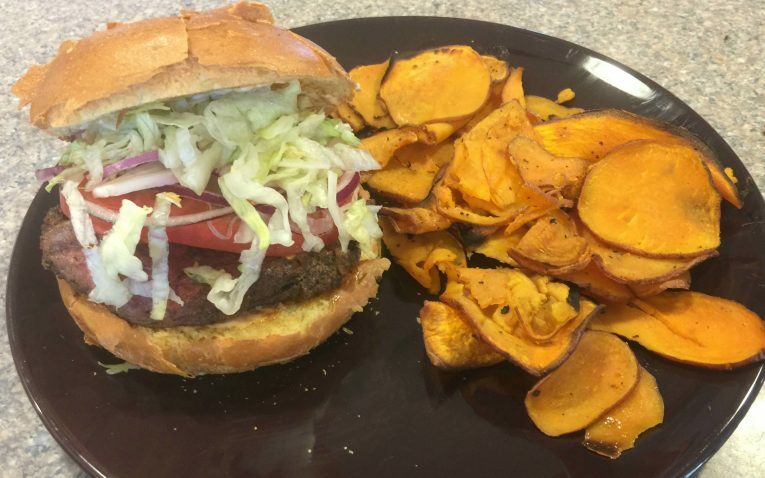 There isn’t a wide variety of meals to select from like you would get with other meal kit services. You basically get the 3 meal options in the box type you selected or you have to skip that week. You can easily skip weeks or cancel your subscription at any time. You just have to be sure to make the changes by 11:59 PM 5 days before your scheduled delivery. If you have can’t eat or don’t like shellfish, nuts, etc. let Pantry Boy know and they will make every effort to accomodate you by substituting ingredients. 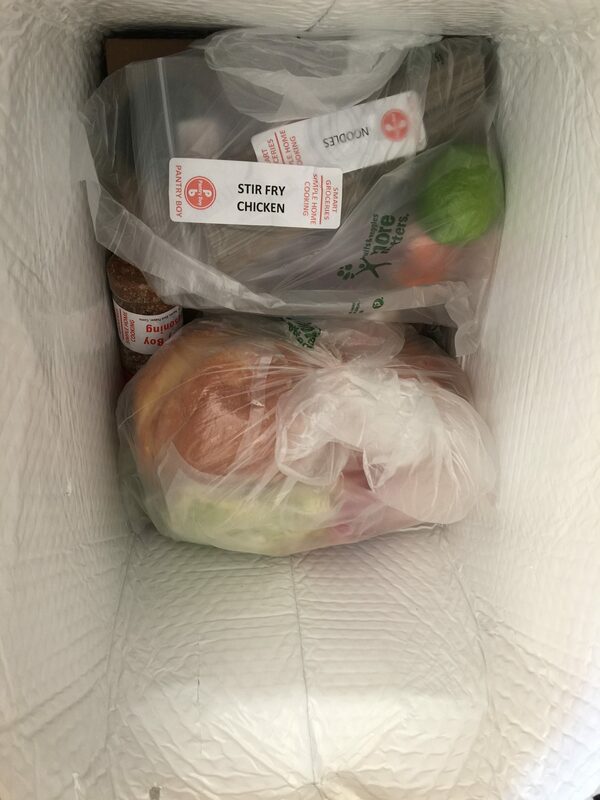 However, if you have severe food allergies you may not want to order from Pantry Boy – as their may be cross contamination during their processing. There is no flexibility in substituting meals. The meals for each box are preselected each week and you aren’t able to change individual meals. So if you don’t like a particular meal that week, you will have to either try it anyway or skip that week. The variety of foods even within each box type are quite impressive. In the carnivore box we ordered we got Skirt Steak Sandwiches, Indian Curry Chicken, and Stir Fry Chicken and Noodles. The Vegetarian box was just as impressive with Gobi Aloo (which is a dish made with potatoes, cauliflower and Indian spices), Couscous with Roasted Vegetables, and Ribollita Tuscan. You definitely get to try foods with a lot of variety, and possibly some that you wouldn’t normally choose for yourself. This definitely pushes you to experiment with flavors you wouldn’t normally try. The ingredients are fresh and flavorful. 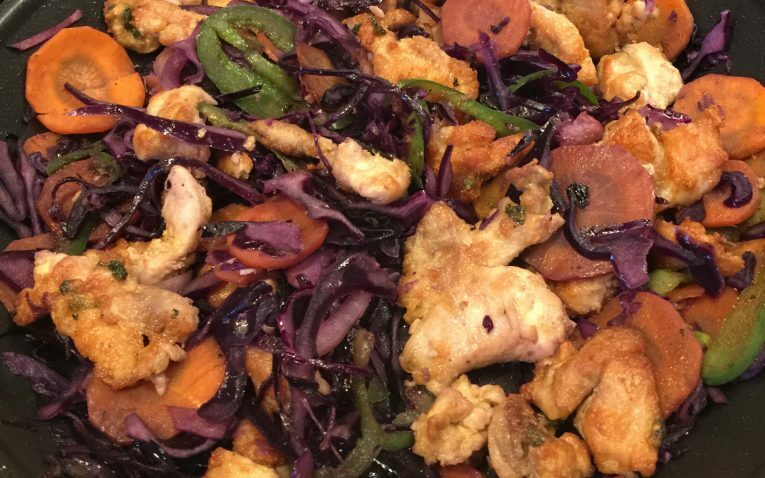 If you know that you don’t like a particular type of food – Curry for example, then you may be out of luck if there is a curry dish featured in your box for the week. You would either have to take it anyway, or skip that week all together. The ingredients are fresh and pre-proportioned. All ingredients are washed, chopped and ready to use. The ingredients in our box were definitely very fresh and good quality. 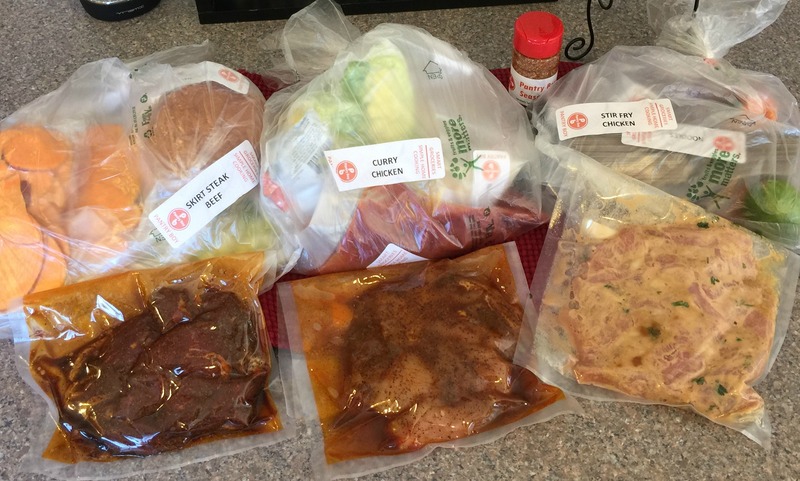 Everything except the buns came vacuum sealed to insure they stayed fresher, longer. We found that the calorie count for the Carnivore box averages around the 700 to 750 range – which isn’t terrible. The vegetarian meals were a bit lower around the 650 range to 670 range. Calorie counts are clearly listed on each recipe when ordering a box as well as on the recipe cards. Although they attempt to utilize local farmers, purveyors and suppliers to source the most ethical and freshest ingredients, they do not specifically offer organic or non-GMO ingredients. There is very little information on where or how they source their food and ingredients. All of their ingredients are labeled “Smart Groceries”. So we aren’t sure if this is the company that is simply packaging the ingredients for Pantry Boy, or if they are also responsible for sourcing the ingredients. It would be nice to have a little more information – either on their website or in their literature – on how and where they source their ingredients from. People today like to know that more about where the ingredients they are purchasing came from. 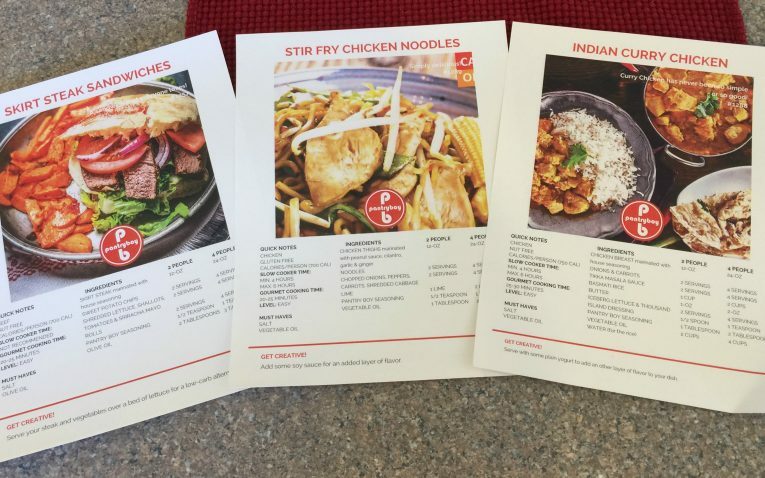 The recipe cards also don’t list the nutritional break down of the meals, other than listing the calorie count. The vegetarian box will run you $53.94 for 3 meals for 2 people. That equates to $8.99 a serving. 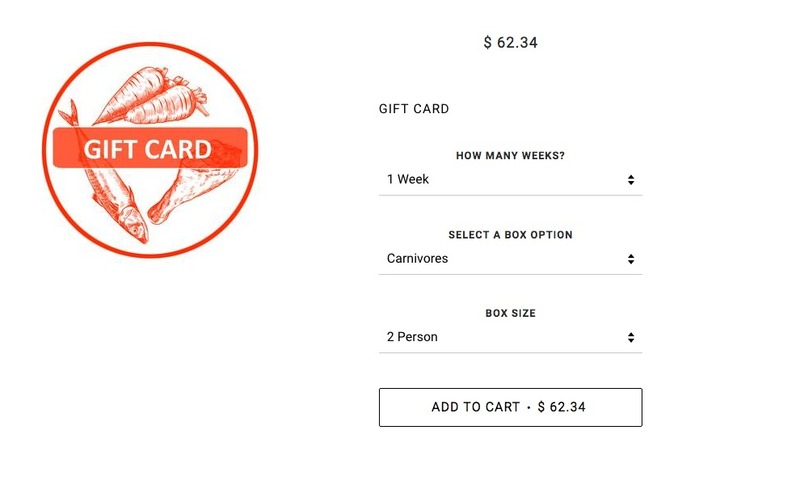 The Carnivore box ships for $62.34 for 3 meals for 2 people which equates to $10.39 a serving. The Omnivore box is $58.14 for 3 meals for 2 people which puts it at $9.69 per serving. The per serving price is exactly the same whether you order the 2 person or 4 person box. 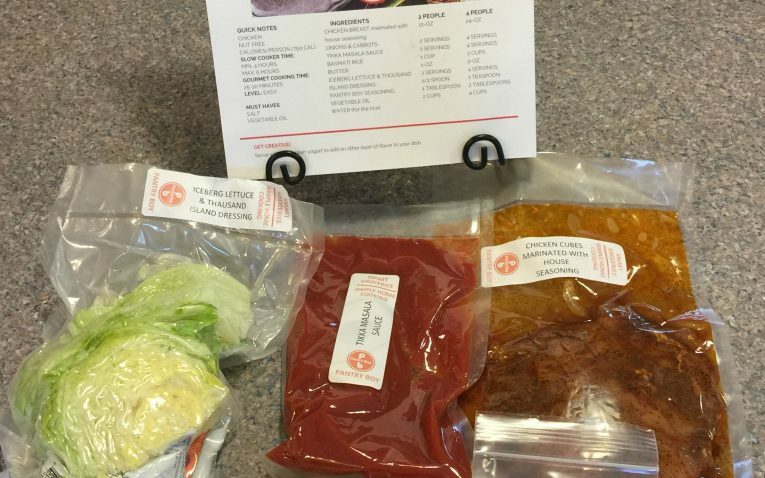 These prices are actually very reasonable compared to other meal kit delivery services. You pay weekly for the meals you order that week. We had no complaints on price. The Pantry Box pricing is very reasonable even for families. 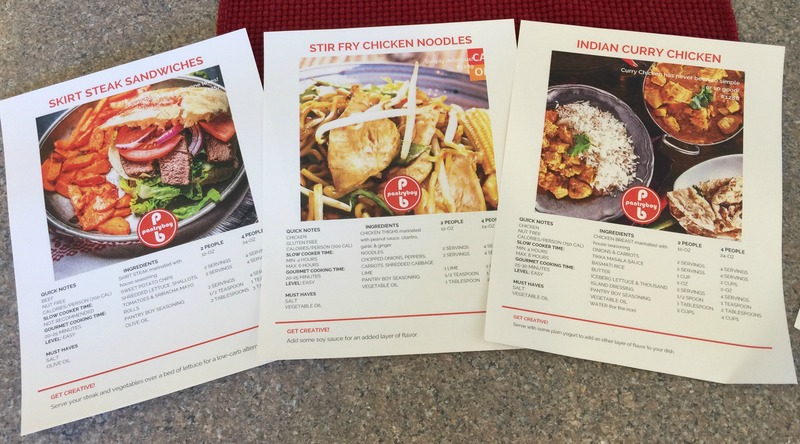 Each recipe comes with a full size card with a picture, ingredients list, ingredients you need to provide, and cooking time required on one side. The other side of the card has step by step instructions for each type of cooking (stove-top or crockpot). The instructions were easy to follow, however we found ourselves flipping the card over multiple times to reference the ingredients list with the measurements. It could be nice if that was on the same side of the card so you aren’t constantly flipping. They do give you measurements for both the 2 person and 4 person on the same card, and we found a slight typo on one card where the measurement the vegetable oil was actually the measurement for the water, and the measurement for the water was missing. This could have been a huge problem, had we not figured out that there was no way we needed 2 cups of vegetable oil, and therefore it must be the measurement for the water. With our Stir Fry Chicken and Noodles we also noticed that the instructions called for “Make Salad” and told us to place our salad mix in a bowl. However we didn’t get any salad mix in the package, and the ingredients list didn’t list a Salad mix either. This left us confused if we were supposed to provide a salad on our own, or if that had just been left out of our box. Either way, we didn’t have salad with that meal. We also noticed that not much information is actually provided about the ingredients included for each meal. For example we loved the noodles in the Stir Fry Chicken and Noodles – they were an interesting color (see in our picture below) – however there was no information about them, like what they were made of, what they are called – other than noodles, or history. It would have been nice to know a bit more about the dish. 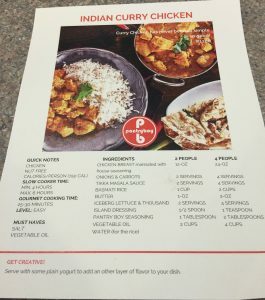 We also found this to be true of the Indian Curry Chicken – it would have been nice to have a bit more background on the dish, as well as the sauce that came with it. Having never eaten curry, I was curious about it, however the sauce came already made so I really had no idea what was in it. We also found that with two of the meals the flavors were a bit lacking. The Indian Curry Chicken was just “ok” – the sauce was a bit flavorless and flat. And with the Stir Fry Chicken and Noodles it could have used a sauce – it was beyond dry, and I had to add some Kung Pao sauce of my own to moisten the loads of noodles you get with it. In the case of the Stir Fry Chicken and Noodles it would have been nice if they had given us some kind of peanut sauce for the noodles to accompany the peanut sauce that the chicken was marinated in. 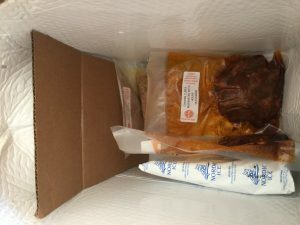 Pantry Boy comes is a plain brown shipping box, but inside it is lined with an insulated bag that is sealed and contains all of your ingredients. When you open the box the first thing you see is a Welcome To Pantry Boy letter from the founder Budo Bunul and then the recipes and a “Make The Best of It” tips and information sheet. This sheet gives you information on shelf life, their Zero waste concept, cost of Pantry boy vs. Grocery Store or Take out, and a bit more information about their service in general. 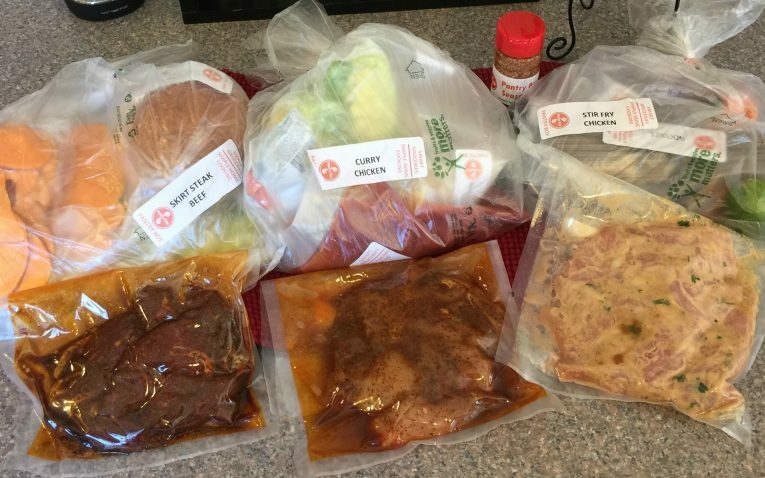 All of the fresh ingredients are packed together by recipe – so all of the Skirt Steak Sandwiches ingredients were in one plastic bag – that were then labeled with the name of each recipe. This made it easy to store in the refrigerator and take out for each meal when you are ready to cook. 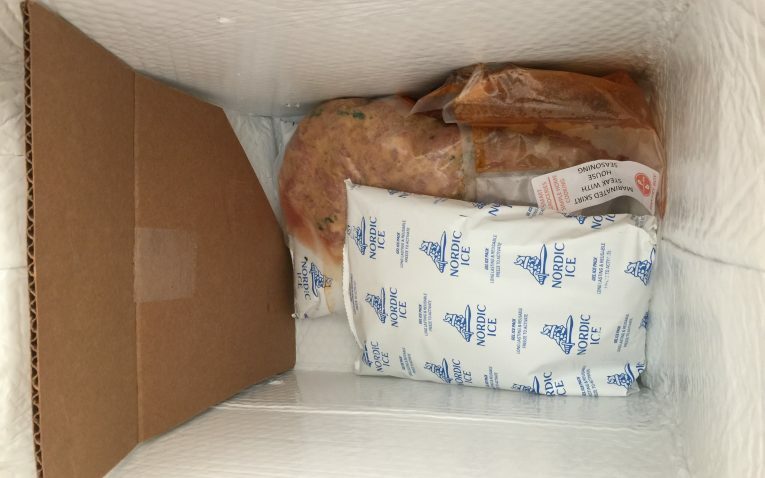 The meat for each recipe was packed separately at the bottom of the box with two ice packs. 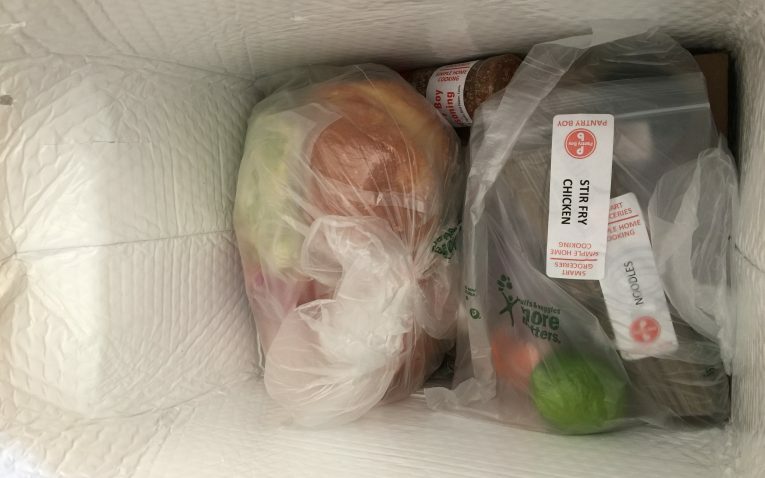 The meat section is also separated from the fresh ingredients by a piece of cardboard. The meat was still perfectly chilled. Everything is labeled individually with the name of the recipe. There were no ice packs on the top portion of the box with the the fresh ingredients. 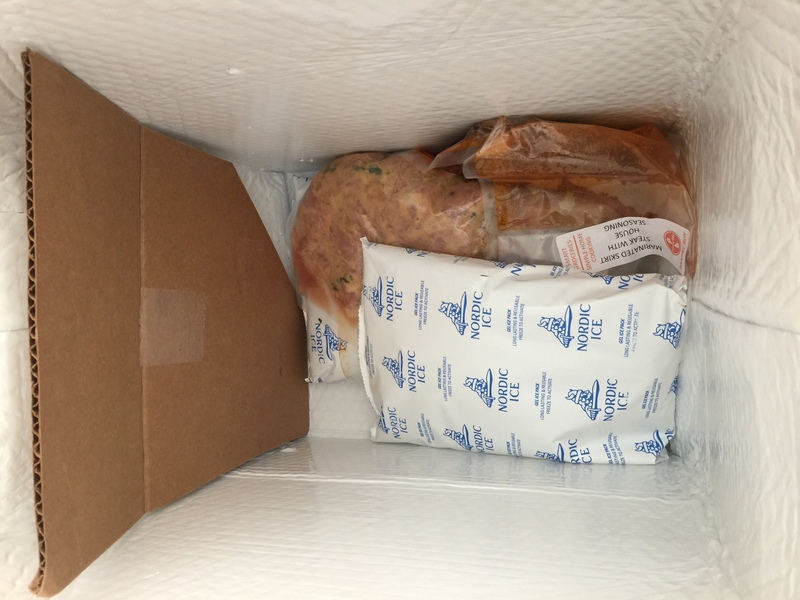 We feel that during hot shipping times of the year or hotter areas of the country, having just the two ice packs at the bottom of the box may not be sufficient to keep everything cold enough. 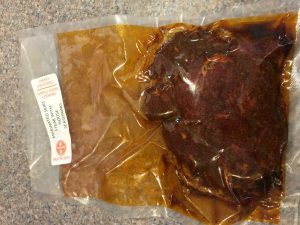 Also the meat was vacuum sealed, but it wasn’t double packed in another zip style bag. 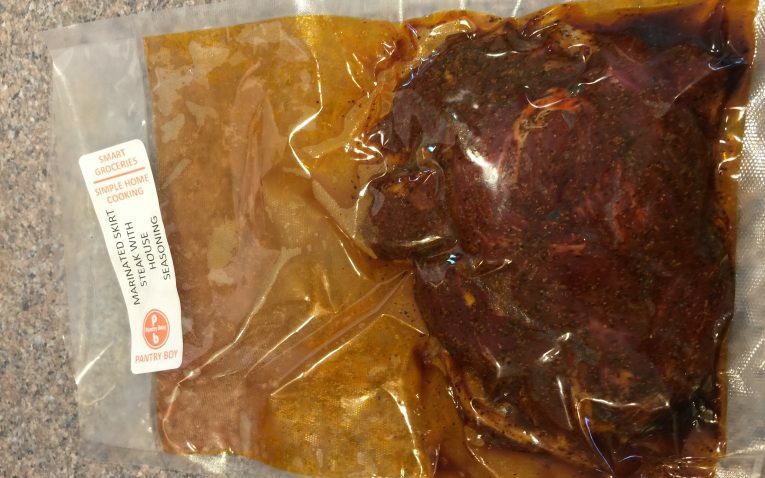 This could be a problem if the vacuum sealed bag were to leak and potentially contaminate the other ingredients – however with the fresh ingredients being in a plastic bag of their own and being separated by cardboard from the meat it would be unlikely. 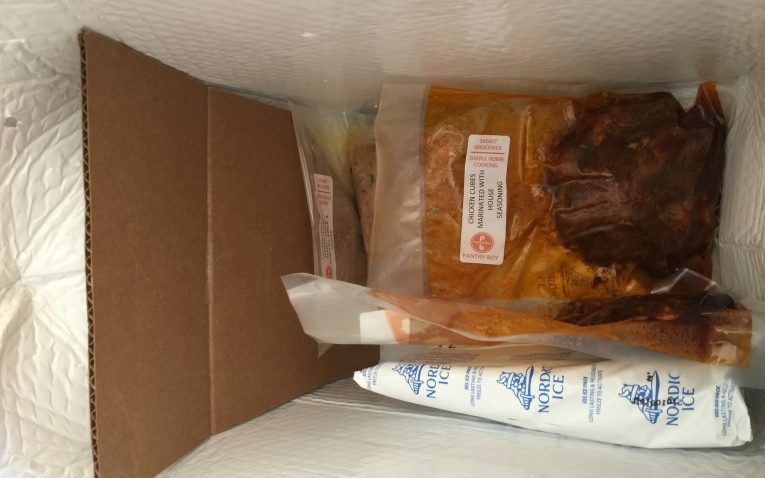 With Pantry Boy meals are delivered weekly. They state that they do weekly shipments partly to help you with weekly home cooked meals, and secondly to better communicate with their suppliers to get just the right amount of ingredients. 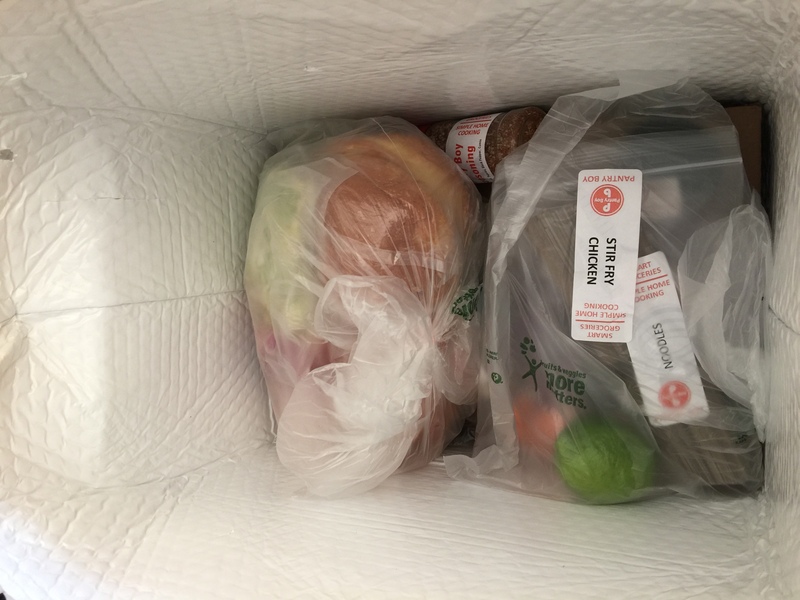 They try hard to not be part of the 40% food waste that occurs in the U.S.
You can skip any week you want, and you can select to have your meals delivered on Wednesday, Thursday, Friday or Saturday of each week. Food for each week is shipped in an insulated box that contains frozen ice packs to keep your meals cold. Ingredients for each meal are grouped together and separated into bags that are labeled for each meal – which makes it easy storing, and cooking. Shipping is Free for all Plans, and they do ship during the summer months. Right now they only ship to a very limited area of the U.S. The states they currently ship to are: Alabama, Arkansas, Indiana, Illinois, Mississippi, Rhode Island, New Hampshire, South Carolina, Connecticut, Kentucky, New Jersey, Tennessee, Delaware, Maine, New York, Vermont, District of Columbia, Maryland, North Carolina, Virginia, Florida, Massachusetts, Ohio, West Virginia, Georgia, Michigan, and Pennsylvania. 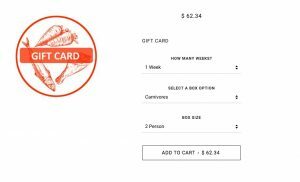 Pantry Boy offers a very flexible gifting option that allows you to send a gift card that provides one to four weeks of Pantry Boy boxes. You select the box type – Carnivore, Vegetarian, or Omnivore – how many weeks (1 to 4) and whether you want meals for 2 people or 4. Pantry Boy gift cards never expire and are delivered via email with instructions on how to redeem them. Unfortunately it appears as though you can’t add a custom message to the email containing the gift card. This is a bit disappointing, as we aren’t sure what the email your recipient receives will actually say, or if they will know it is coming from you. They offer phone, email and live chat support. They also have a FAQ section that answers many of the most common questions a person might have. For any other questions Chat is quickly available and very helpful. We did find the wait time for chat to be a bit long. We were looking for a quick answer but ended up waiting quite a while for it. It actually took so long, that we finally just gave up. I started out as being only one of two in the queue, so it was not like their were a ton of people waiting. It would appear they need to staff their live chat with more people. 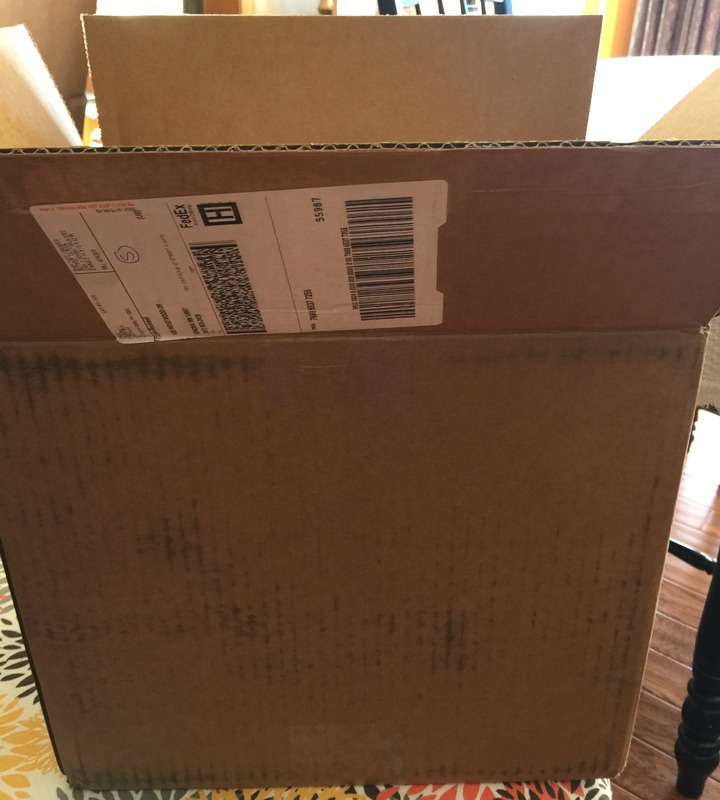 Shipping is always Free for all Plans. 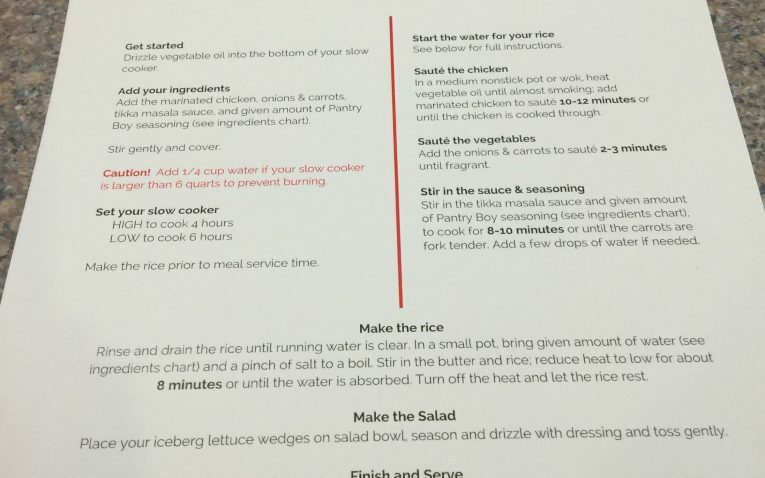 Each plan contains 3 meals. 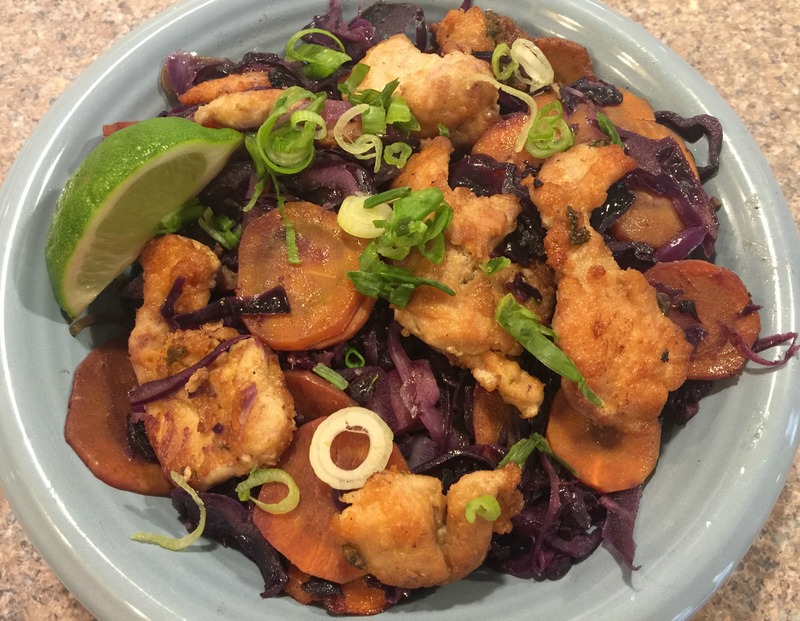 Pantry Boy provides quick, easy meals with recipes from around the world. Save $60 right now on any plan from Pantry Boy! I would definitely put Pantry Boy in the Novice category, as everything you need comes ready to use – no chopping, slicing, or even washing of ingredients. The recipes are uncomplicated and the steps are easy to follow. Children could easily jump in and help with cooking the Pantry Boy meals, without worrying about knife skills or a lot of chopping and slicing. Pantry Boy works for couples and families. We found that even their 2-person meals provided enough food for three, or for a nice lunch of left-overs for the next day. 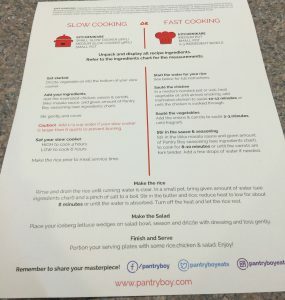 I feel that Pantry Boy will most appeal to those who are looking to quickly put a meal on the table without a lot of effort and prep time. 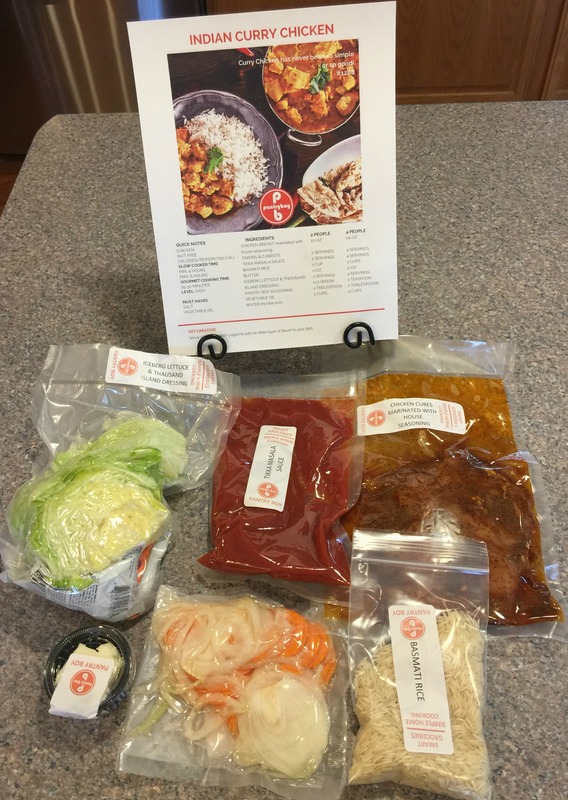 As long as you are willing to accept the meals that they select and ship to you each week, you will find Pantry Boy a wonderful way to explore new flavor profiles and recipes from around the world. Quick and Easy: I liked the fact that all the vegetables came already sliced, chopped or shredded, and the meats were already seasoned and in the portions they needed to be. It truly made cooking and putting the meal together a breeze. We were able to have dinner on the table in 30 to 45 minutes maximum, in most cases. 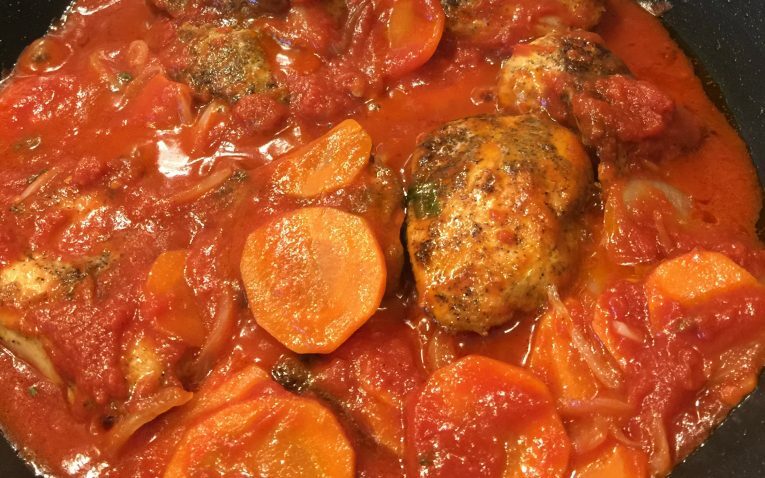 There are times I like to make a more involved meal, but during the week, when everyone is in a hurry it’s nice to be able to whip up a quick meal that tastes great. 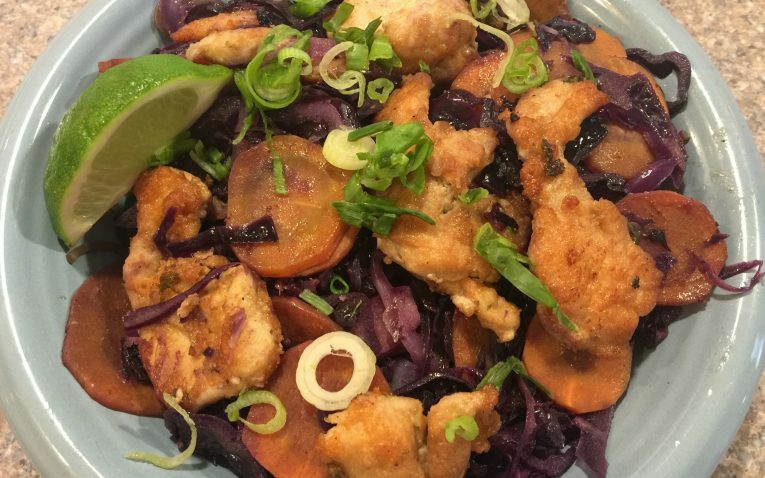 Recipes from Around the World: You get to explore flavor profiles from around the world. In the box we received we had a Stir Fry recipe and an Indian Curry recipe. Personally, I’ve never had curry so that interested me quite a bit. This is a nice, easy way to expand beyond your normal eating habits. More than Adequate Portions: The portion sizes we received were more than adequate for for 2 people. You could have easily served 3 people. This is nice for larger appetites, and for those who don’t eat as much, you have enough for lunch the next day. You definitely get your money’s worth. 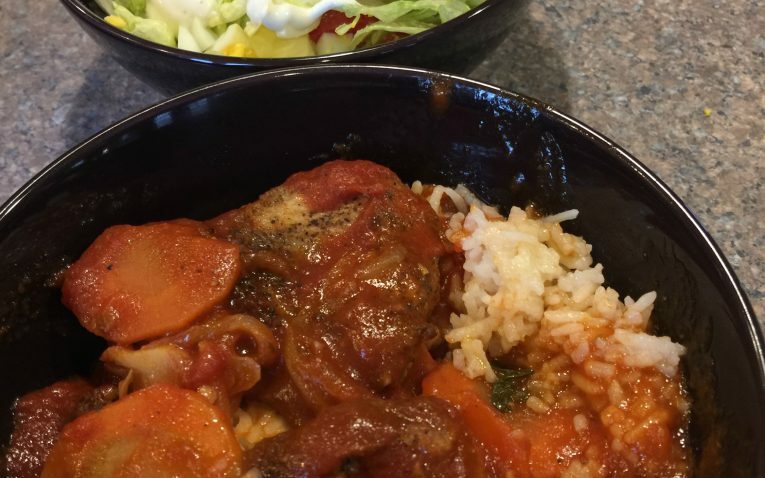 Limited Weekly Meal Options: With only six menu options available each week – three for each type of box (Carnivore, Vegetarian, Omnivore – pulls recipes from the other two), you really have no options. You get the meals that are designated for that box and can’t substitute. It doesn’t give people any choices if they don’t like a particular ingredient or type of food – you either try it anyway or skip that week all together. 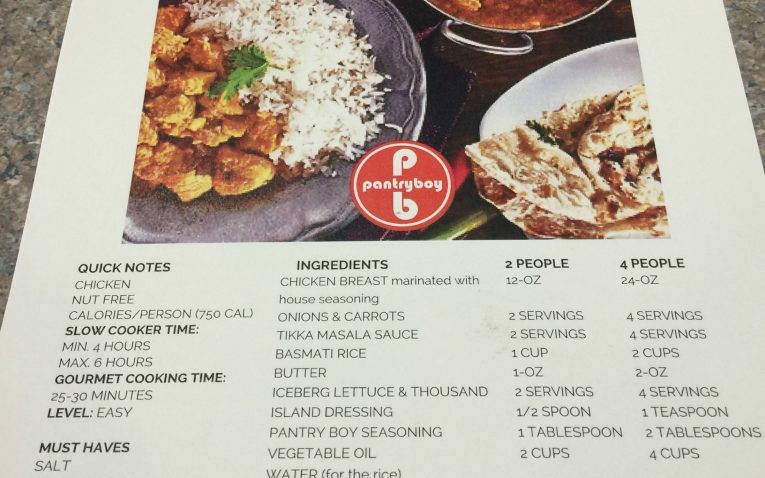 Limited Information About Each Recipe: Pantry Boy doesn’t really provide much information about a particular recipe – like background, where it originated, or details on the ingredients used. 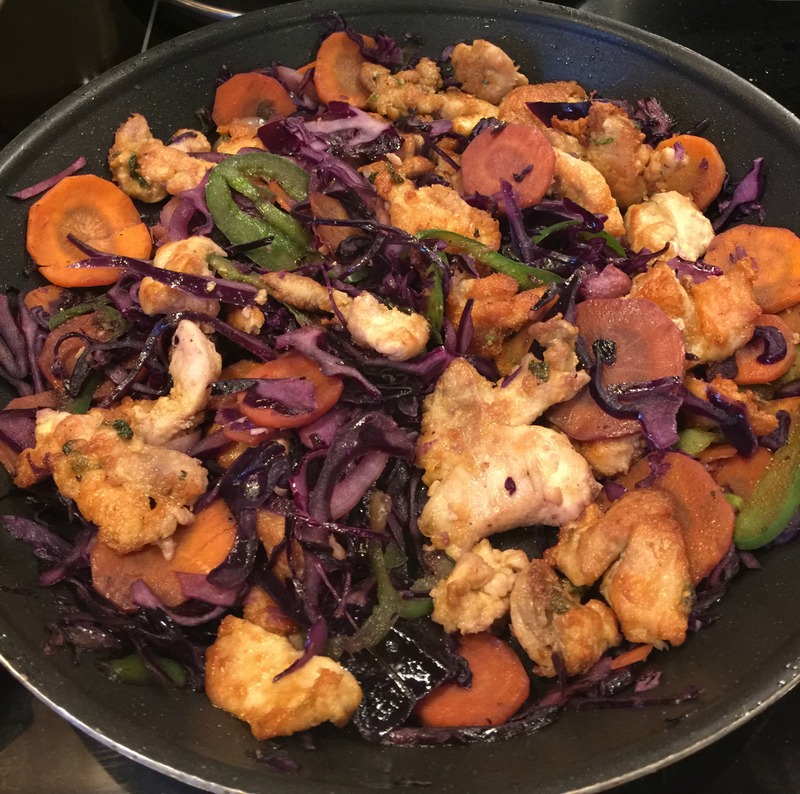 When trying recipes from around the world, it would be nice to know a bit more about the dish and it’s ingredients – especially if it’s a type of food like the Curry that I hadn’t tried before. 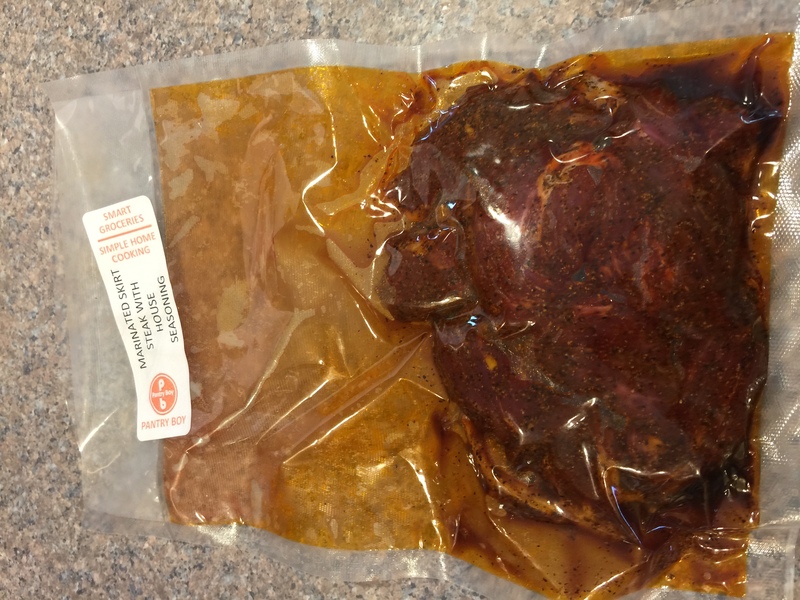 What is Tikka Masala Sauce? What’s in the sauce? Why is it called that? 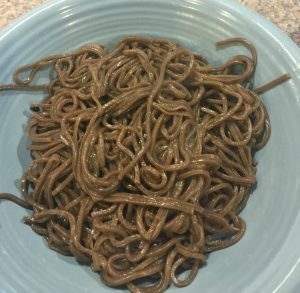 What were the noodles in the Stir Fry made of – they were an interesting shade of gray. Flavors Were A Bit Flat: This may be because the Tikka Masala sauce was pre-made, but we felt that it didn’t have much flavor other than that of tomatoes. Maybe if there was an additional package of fresh spices or herbs it would have been better. In the meals we had, they didn’t utilize fresh herbs or spices much. We also felt that the Stir Fry was a bit dry and could have benefitted from some kind of sauce for the noodles. 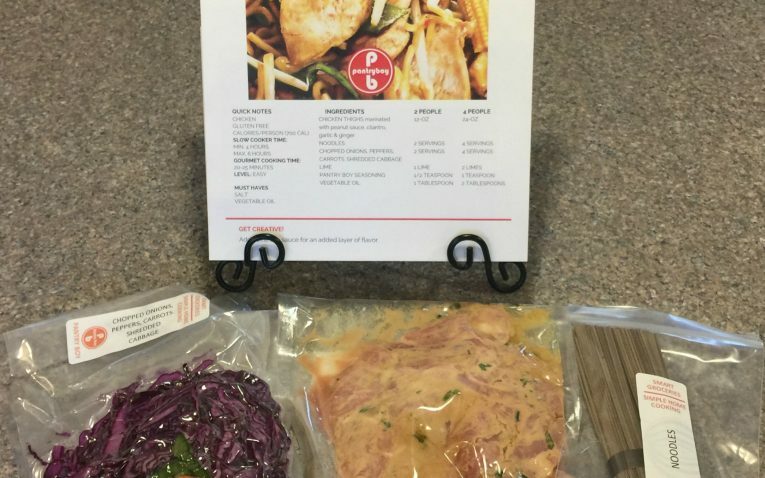 Not For Those Looking To Try New Cooking Methods or Ingredients: If you are looking to try out new recipes that push your cooking skills to the next level or involve spices and herbs you haven’t tried before then Pantry Boy isn’t the service for you. These recipes and meals are meant to be quick, easy and on the table with little to no fuss and muss. 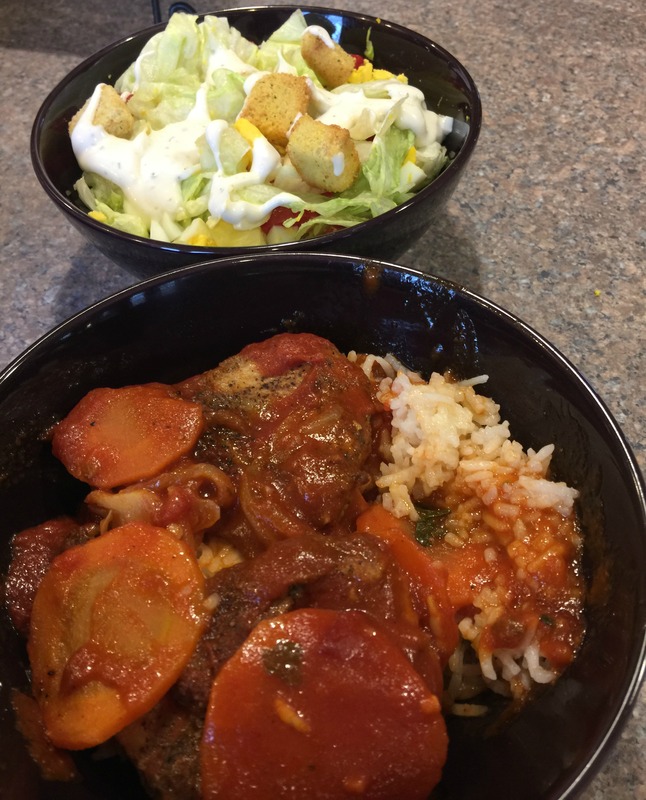 Overall I liked Pantry Boy for quick week night meals for the family, or for just my husband and myself – for those times when you just want to put a quick, good, healthy meal on the table. I’m not sure that I would necessarily use them for a “date-night” type of meal – they just didn’t carry that kind of “wow” factor. 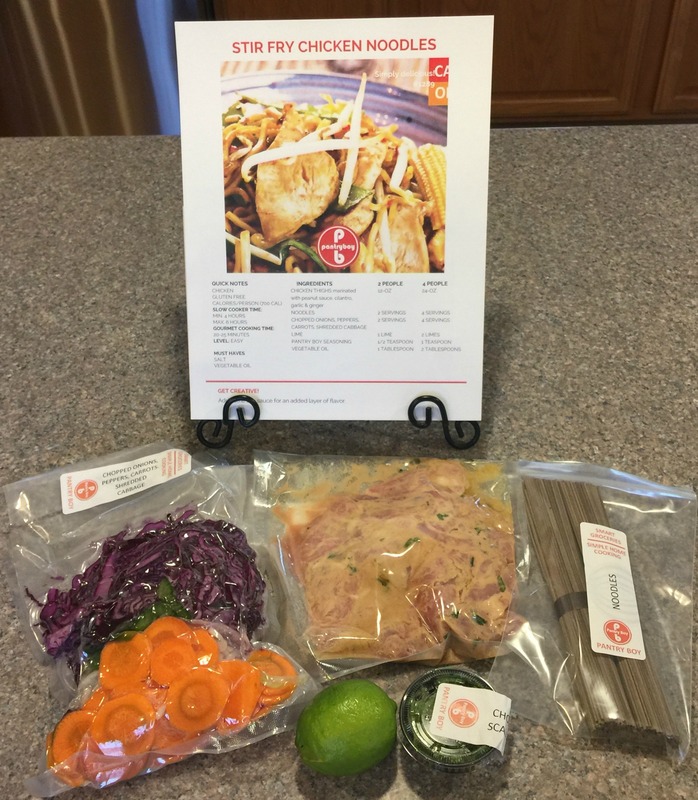 I would recommend them to family or friends, but with the caveat that you shouldn’t expect the same kinds of flavors and fresh taste experience that you would get from a meal kit that utilizes fresh herbs and spices. 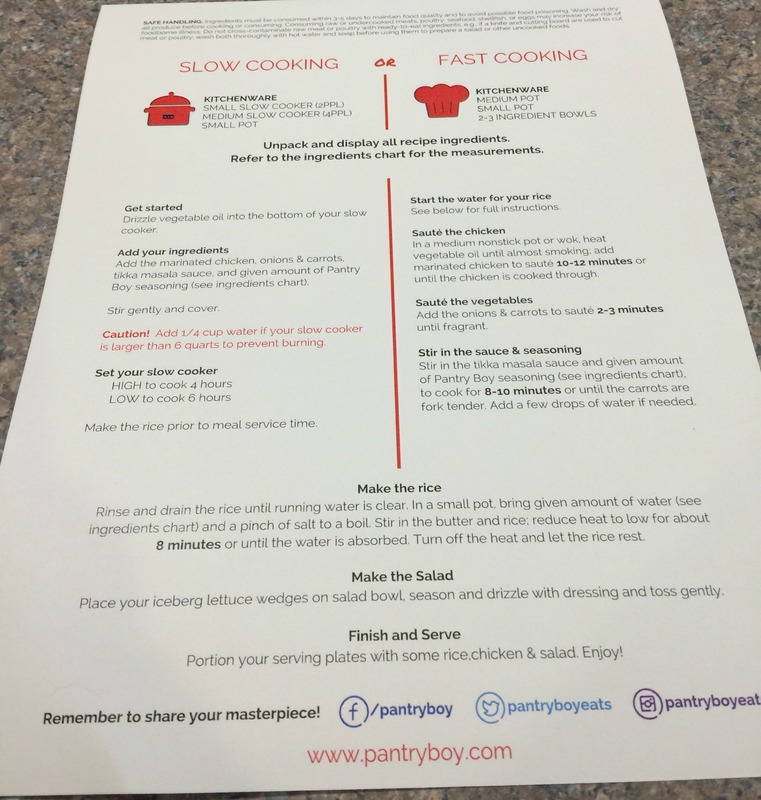 As long as you set your expectation to that of a quick meal that tastes good – but not “wow”, then you will be pleasantly surprised by Pantry Boy. 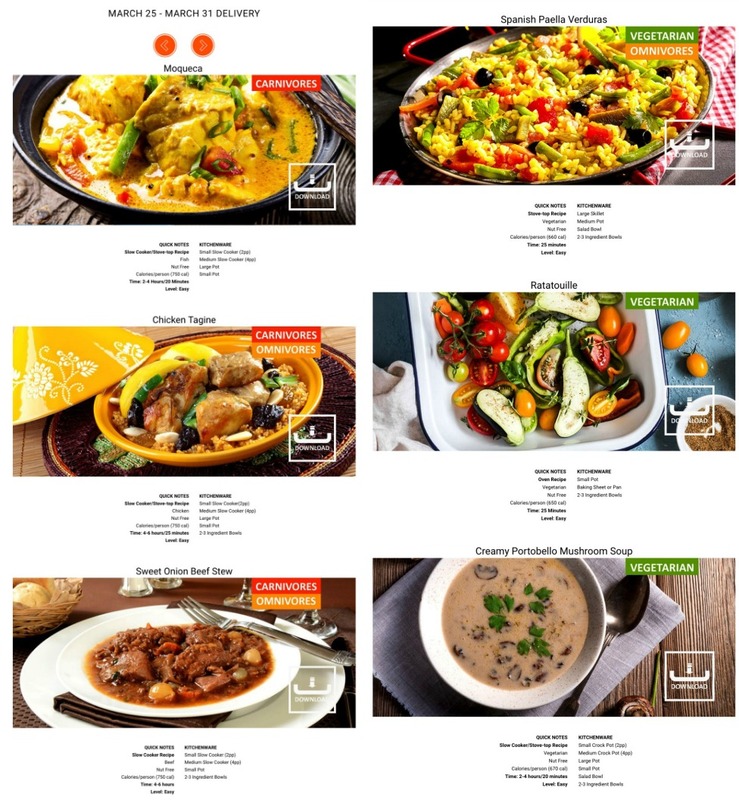 A service that focuses on providing quick, easy, delicious, ready to cook meals.